Building design encourages physical activity to reduce energy use and improve health. To promote human health, occupants of the building are greeted with an inviting stairway with views of downtown Seattle and Puget Sound. The average adult will burn 3,900 calories over the course of a year by taking the stairs, equal to a pound of weight gain. The Miller Hull Partnership led an integrated design team to maximize inherent building efficiency, but they also look to building tenants to play a significant role in achieving the goal of net-zero energy consumption. The Bullitt Center instead relies principally on people power. The staircase is brought right to the front entrance, making it an obvious choice for people who are able to use the stairs. This stairway has near-magical powers: people can’t seem to resist going up. 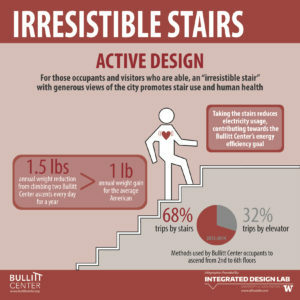 At the Bullitt Center, this phenomenon is fondly referred to as the “Irresistible Staircase.” Aside from being the most convenient mode of vertical transportation, a choice to go with the stair comes with several perks. Stair-goers are rewarded by beautifully crafted wood and steel-clad steps, surrounded by a light glass volume. Extended landings cantilever out over the sidewalk, and create opportunities to take a break or greet a passing friend along the way. The incredible view of downtown and the Puget Sound unfolds as a final gift to those who chose the stairs. 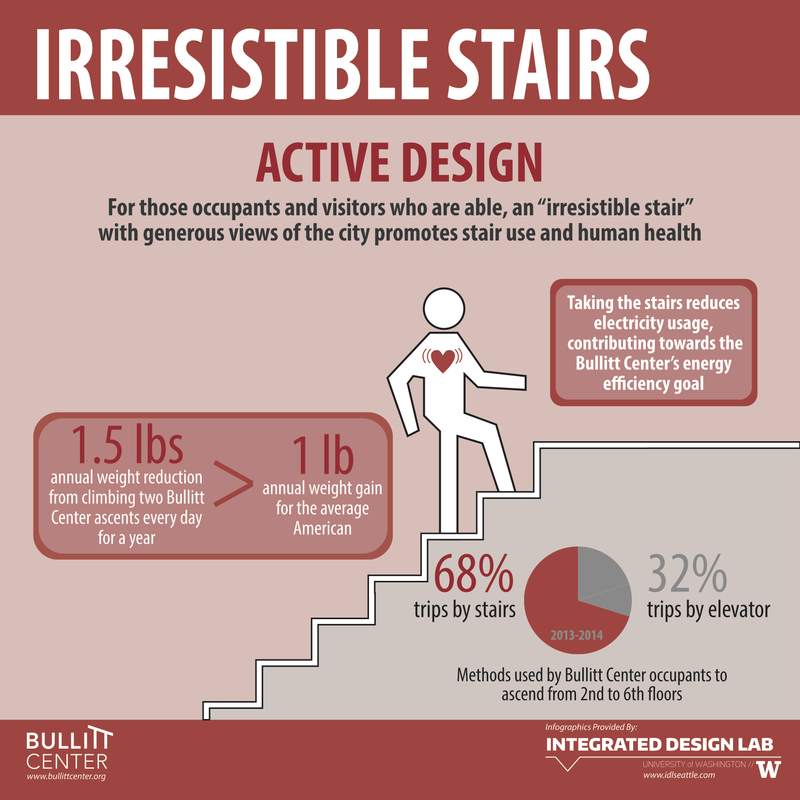 The irresistible stair helps the Bullitt Center conserve energy and encourages the tenants to maintain a healthy lifestyle while at work. In the end, the Bullitt Center is about providing for a healthy lifestyle, and the design of the stair achieves this in more ways than one.